As the night chill settled in after sunset, a handful of onlookers and league curlers gathered on an ice sheet Tuesday for the inaugural night of Bozeman’s first curling league. 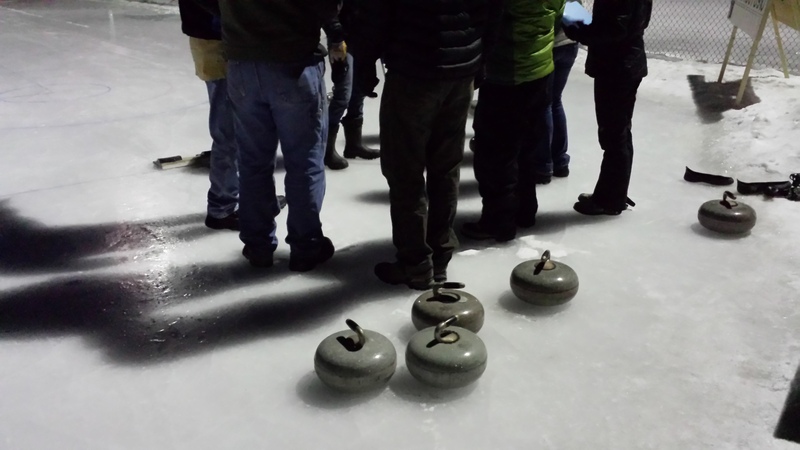 Participants in the first day of Bozeman’s fledgling curling league choosing team captains, known as “skips.” Curling “stones” lay on the ice at their feet. Started by the Bozeman Recreation Department and Adam Turner of the Bozeman Amateur Hockey Association (BAHA), the league’s first meeting at Southside Park on Fifth Avenue and College Street drew people of all ages to the curling sheet to try their hand at the Olympic sport. “This is the first time we’ve done this and the response has been tremendous,” said Jamie Saitta, the Bozeman recreation manager. Turner, the BAHA hockey director, has partnered with Saitta to get the league going and instruct the curlers. Adam was very enthusiastic Tuesday – running up and down the curling sheet, shouting instructions and sharing his knowledge of the sport with beginners. Known as one of the oldest team sports, curling involves sliding granite stones or, “rocks,” down an ice sheet toward a target known as the “house” at the other end, with each team scoring points the closer they are to the “button” at the center of the target. As the rock travels toward the house, sweepers use brooms to rapidly brush the ice in front of it to increase distance and straighten the stone’s path. Points are tallied when eight stones are delivered from each team. With space and equipment limited and an outpouring of interest, the league has been capped at 12 teams and will run until Feb. 8. There are usually teams of four, but the Bozeman league is accepting teams up to six. Those interested can sign up for the second of two curling clinics taught at Southside Ice Rink on Feb. 22. Saitta stressed that you can also register online for the waitlist and there will be a “day of curling, or a mini-league,” set up for those on the waitlist so everyone can get a chance to use the equipment. “This is the start of something that I believe is going to be big,” she added.